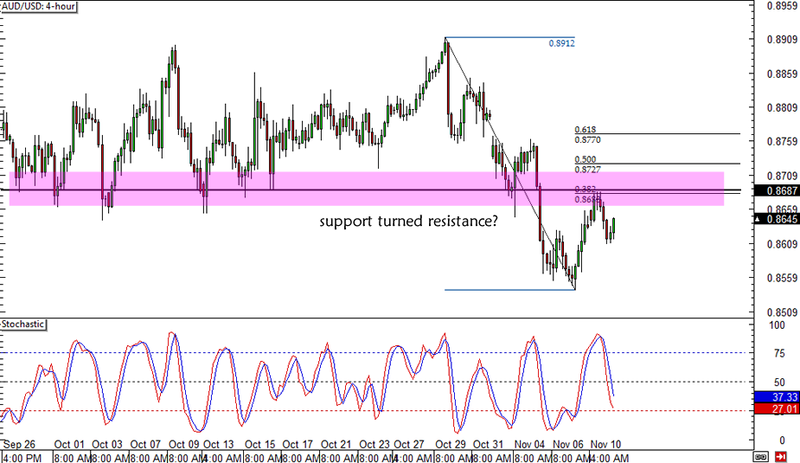 Forex Trade Idea: AUD/USD Retracement to .8700? Hey, comdoll buddies! I’m back with another short-term technical forex trade idea for this week. Let me know what you think of this AUD/USD setup. I’m looking at this simple pullback setup, as the pair recently broke below support at the .8700 handle. The 38.2% Fibonacci retracement level seems to be holding as resistance but I’m thinking AUD/USD could still make a higher correction until the .8700-.8750 mark before resuming its drop. Risk appetite appears to have weakened lately due to resurfacing geopolitical tension in eastern Ukraine, and this might take its toll on the higher-yielding comdolls. Apart from that, economic data from Australia and China have mostly been disappointing, which suggests further downside for this pair. I’ll wait for reversal candlesticks around my sell area before setting orders and I plan to set my stop past the 61.8% Fib or the .8800 mark. I’ll be aiming for new lows but I’ll be trailing my stop once price tests the previous lows around .8550.